Welcome to an exciting new collection of cards that will no doubt enhance your performances and open your mind to boundless possibilities. 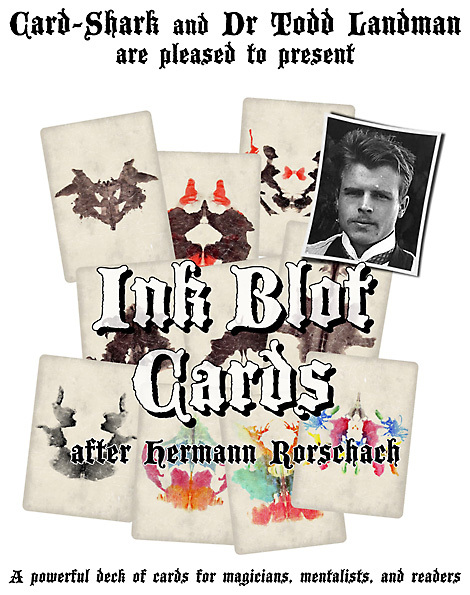 Ever since the middle of the 19th Century, 'ink-blot' images have been used as popular parlour games in certain circles and became a standard method for psychological testing and personality profiling. 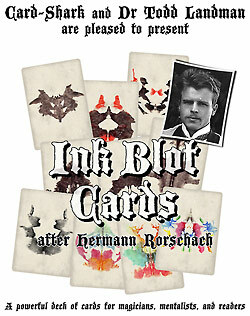 Swiss scientist Hermann Rorschach developed a psychology test named after him that uses ten different ink-blot images. Metaphysical magician Dr Todd Landman gives deep background info concerning the test and the images and developed several magic routines but also gives tips where to find effects that can easily adapted to these cards. The images are an alternative to the more familiar Zener cards or 'Rhine' symbols used for testing for the existence of extra sensory perception. The history and flexible, yet structured features of these images now available in our vintage style make them perfect for magicians, mentalists, and readers. 5 sets each of the ten cards with different images on them. You also have two additional cards that are designed in the style of the original images, but one appears as an angel and the other one as a devil. The backs are marked, having the same Heirloom Deck backs. The cards are also 'pointer' cards, which opens up a range of possibilities for mentalism effects.